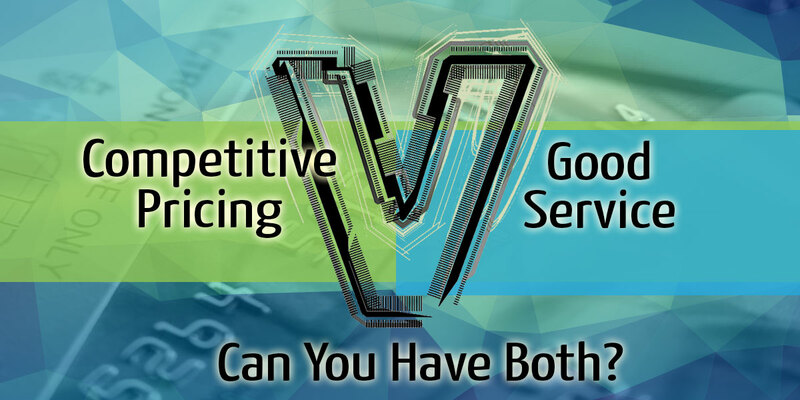 Competitive Merchant Account Pricing vs. Good Service - Can You Have Both? Competitive Merchant Account Pricing vs. Good Service – Can You Have Both? Receiving proper customer service from a merchant services provider is sometimes a difficult thing to accomplish. When shopping for merchant account providers you are faced with the sometimes difficult task of identifying that fine line between being overcharged for good service or paying rock bottom prices and not having direct access to a customer support representative. A lot of business owners focus on rates and price but is that all there is too it? Shopping for a provider on price alone may put you in a tough spot down the road. There are hundreds of options out there, so how do you know which one to choose? Search for and sign up for service with a provider that will give you rock bottom pricing. They will honor that 0.49% advertised rate and by choosing this option you seemingly have yourself a nice inexpensive and cost effective merchant account. However, you are dumped into the customer service queue asked to wait in line by taking a virtual number when you have questions about your statements, terminals or service in general. A direct representative is NOT at your disposal. Choose a provider who has a reputation for taking care of their clients. This company answers your calls and emails when you request information.This provider may charge slightly more than the rock bottom option but will be there when the time comes to adjust rates, change contract terms or exchange your credit card terminal and other equipment if applicable.This is middle of the road pricing. Unknowingly say yes to the sharks that try to take you for everything you have. These companies over charge you for the equipment, and up-charge the rates on the processing contract. They possibly misrepresent the deal that you are getting all in effort to simply close the deal. Once you buy from the sales rep or online ordering system, you will likely never hear from them again and you’re stuck in a contract that you can’t get out of without paying a huge cancellation fee. Hopefully option number two seems ideal to you. I know, it’s nice to pay a fair price and be offered a level of customer service that exceeds expectations. This mentality of course not only applies to setting up merchant services but holds true to other industries and products that you might obtain. What I’m suggesting you do is to remove yourself from the mentality of shopping for and buying merchant services based on the criteria of price only. Time and time again I am asked by business owners just like you to give them the best possible rate, or the lowest rate available, citing 10 other companies that are willing to offer the same thing. I bought a commercial grade printer recently from well known and recognizable brand. It was a full color printer and for the first three months it did the job perfectly. I attempted to contact the manufacturer multiple times and to make a really long story short, it took me over a month to get the printer fixed under the warranty service that I had purchased. During my calls to the manufacturer I felt completely left in the dark. The only recourse was the retailer that I purchased the printer from and all they would do is pawn me off to the manufacturer. Hence, the vicious cycle of corporate customer service. If I had bought from a provider who also serviced the printer I would have been in a lot better shape. I should have known better, but we all make mistakes right? Where do you stand with your current provider? Which category from above would you place yourself in? The middle of the road pricing (option number 2 from above) is most definitely available to you if you just research and buy from a provider that has a track record of success. In other words, someone who makes their customers happy.